A Facebook friend, Vickie Farquhar, told me about a special gift, produced right here in Cairns, that I should share with my readers. 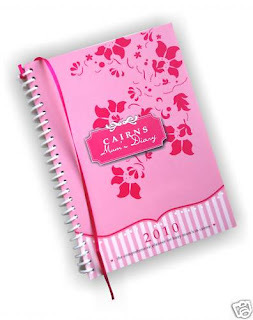 It's the 2010 Cairns' Mum's Diary, for all the mums, and those who have one out there, and it's a really nice gift idea this Christmas. "The diary is designed exclusively for busy mum’s living in Cairns," says publisher and Brinsmead mum, Samantha Thyrd. This is the first edition of the Cairns Mum's Diary. Samantha says there wasn't a diary on the market that facilitated her needs in Cairns. "It's a handy A5 size, perfect for handbags or to sit by the telephone. I designed the diary out of necessity for some sanity," Samantha says. "I am a graphic designer, so figured I could put my skills to some good use and help other mums in the process. I have always wanted to work for myself and somehow raise funds for the Muscular Dystrophy Association, and producing the diary would help me to do just that," she says. Samantha's brother died of Muscular Dystrophy when he was just 18, and his group of friends didn't make it past the age of 14, she says. Muscular Dystrophy is a muscle degenerative disability, and sufferers are born with it, and rarely live past the age of 20. "I'm passionate about helping anyone with a disability, especially children. If I can help just one child improve their quality of life, I'll feel like it's all worth it." The Cairns' Mum's diary is aimed at mothers living in Cairns. 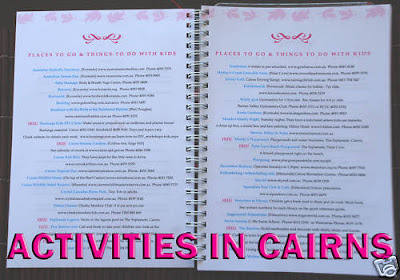 It highlights Queensland school and public holidays and has all the relevant family "what to do" activities in Cairns. "There's many Cairns events which are family friendly," Samantha says. 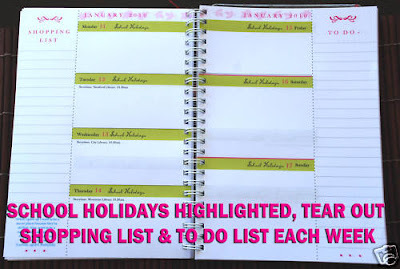 "Each week, there is a tear out shopping and to do list, and its in A5 size, which is convenient for the handbag. 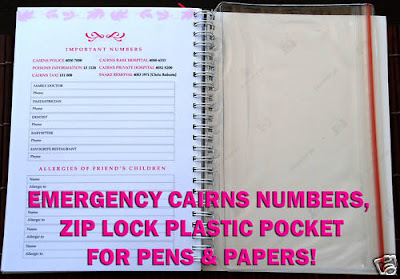 It has a PVC plastic zip lock pocket to keep loose papers and pens," says Samantha. To get your copy for available for $24.95 and support the Muscular Dystrophy Association, order via the website, from many local Cairns stockists, or email Samantha. I just saw them yesterday - looks awesome!! I bought one for my DIL for Christmas. She runs a home day care centre and it's great for keeping a quick record to enter into her computer - not to mention she has all the outings info at her fingertips. Well worth the $$.